Easter Birthday Invitation - Printable DIGITAL FILE - Pastel Pink, Blue, Purple & Yellow Easter Bunny Birthday Party Invite - Add A Photo! 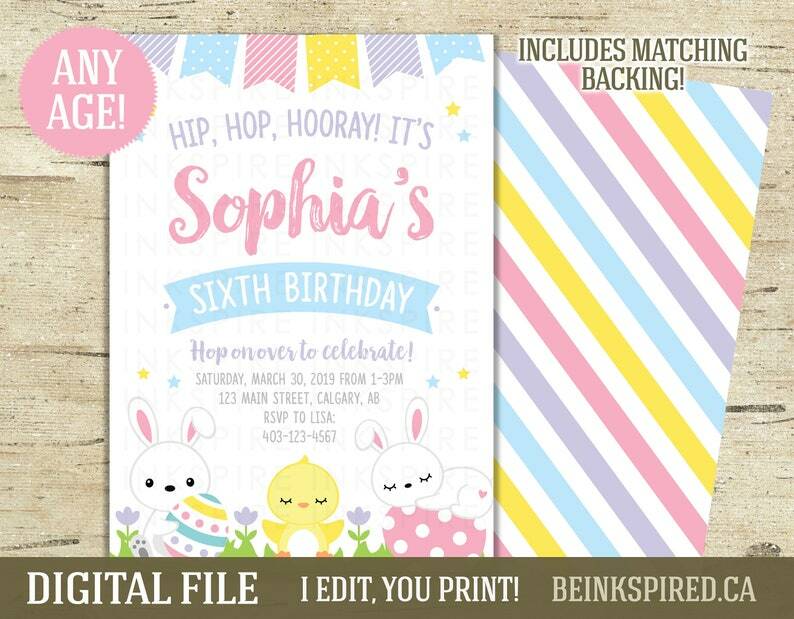 Select an option 4"x6" 5"x7"
Invite your guests to HOP OVER to your child's EASTER BIRTHDAY party with this personalized invitation... I EDIT, YOU PRINT! ► Step 2: I edit the invitation and e-mail it to you. ► Step 3: You print as many copies as you like and send them off. * This listing is for a DIGITAL COPY of this design. This means that no physical product will be mailed to you. Instead, a file will be e-mailed to you, for you to print yourself. The current turnaround time from receiving your order to sending you your first proof is 1-2 BUSINESS DAYS (Monday-Friday, excluding holidays). Please allow 24 hours for each revision. ► Step 1: Select a SIZE from the drop-down menu. ► Step 2: Select a VERSION (photo or non) from the drop-down menu. ► Step 8: A proof will be sent to you within 1-2 BUSINESS DAYS of receiving BOTH your order and your child's information/photo UNLESS you have paid to RUSH your order. ► Step 9: Once you approve your design, your files will be e-mailed to the e-mail address listed on your Etsy account along with some printing recommendations. Your files can be printed at any print shop (e.g. Staples, Office Max) or any photo lab (e.g. Walmart, Costco, etc). Easter Birthday Thank You Card - Printable DIGITAL FILE - Personalized Easter Bunny Thanks Card - Add a Photo! Bunny Birthday Party Invitation - Printable DIGITAL FILE - Personalized Easter Birthday Photo Invite - Any Age! Add a Photo! Gone Fishing Birthday Invitation - Printable DIGITAL FILE - O-fish-ally One First Birthday Party Invite - Includes Matching Backing! Fiesta Birthday Invitation - Printable DIGITAL FILE - Mexican First Birthday Party Invite - Any Age! Photo Version Available! Easter Bunny Birthday Party Welcome Sign - Printable DIGITAL FILE - Personalized Girls Pastel Easter Poster - Change the Name & Age! Paint Birthday Invitation - Printable DIGITAL FILE - Boys Paint Splatter Photo Party Invite - Any Age! Other Colors Available! Paint Birthday Invitation - Printable DIGITAL FILE - Girls Paint Splatter Party Invite - Any Age! Other Colors Available! Blue Donut Birthday Invitation - Printable DIGITAL FILE - Boys Donuts First Birthday Party Invite - Any Age! Other Colors Available!